Email Spam & Filtering – Quality Computer Services, Inc.
Quality Computer Services, Inc. helps Pittsburgh companies protect their computers against online threats and email spam. Email is one of the most valuable assets for running your company. But if you are not protecting your primary mode of communication, you leave yourself vulnerable to cyber-attacks such as spam, phishing, viruses, and malware. Let Quality Computer Services, Inc. (QCSI) provide you with a solution so that you can focus on your business. We provide cloud-based SPAM filtering and email archiving through Reflexion. SPAM is quarantined before it even reaches your network while our email archiving system provides you with offsite protection for email that must be saved for compliance. Reflexion’s hosted solution is particularly appealing if you want a simple, no-maintenance solution to protect your inboxes from email-borne malware. ✓ Holding inbound email automatically for later delivery. This managed email threat protection service offers you significant advantages over onsite appliances and locally deployed software. Reflexion Total Control (RTC) implements an innovative address-based defense to augment traditional email security and spam-blocking methods. This hosted email archiving service operates with your existing IT network to ensure protection, preservation, and continuous operation of email communication for your business. RADAR users have on-demand email access anywhere, anytime. 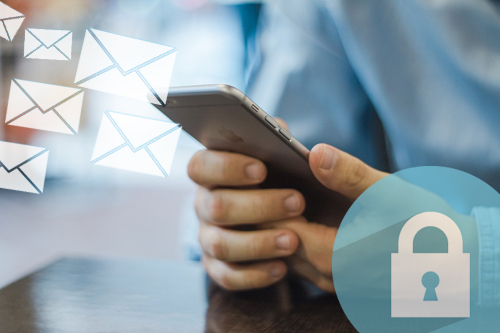 With increased regulatory pressures, identity theft, and highly publicized security breaches, it is extremely evident that email encryption is an important piece of the security puzzle. Companies that do not encrypt emails containing sensitive information are at risk now more than ever. Start protecting your email today. Contact us for more information.